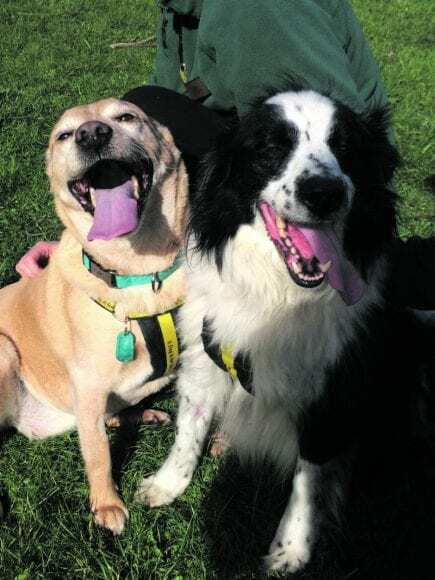 Home Dublin Life Dog of the Week Dog of the Week: Meet best friends Jack and Jessie! Jack and Jessie are two incredibly adorable dogs who can’t imagine life without each other! They came into Dogs Trust together as best friends and are completely inseparable. Jack is a super-friendly nine-year-old old Collie cross that loves everything and everyone. His favourite things in life are walks, yummy treats, belly rubs and attention. Jessie is a stunning nine-year-old Labrador cross who, like Jack, is a happy and positive dog that loves to be spoiled. She can be a little unsure of other dogs, so she will need some training to improve her doggie social skills. They are hoping for a family who can adopt them both and give them plenty of love. They would love a family with children over the age of 10, in a nice quiet area. If you have room in your heart and home for Jack and Jessie then please contact Dogs Trust on 01 879 1000. They are based in Finglas, just off exit 5 on the M50. Map and directions can be found on their website www.dogstrust.ie. You can also find them on Facebook, or Twitter @DogsTrust_IE. Remember: Always have your dog on a lead when in public.